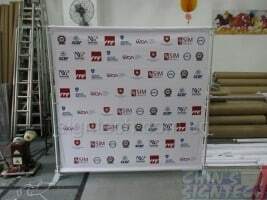 Portable Telescopic Backdrop stand with 2 x 2m PVC banner. You can use it for any event purpose, light and easy to assemble, can expand up to 2.9 x 2.5m. We give you free Velcro cable ties to tie the side bars, you no need to use cable ties, we offer black and white. My advise is you need to stretch all 4 sides to straighten your PVC banner. Especially Fabric banner, once stretched all crease and lines will disappear. 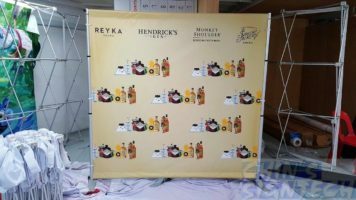 PreviousPrevious post:Pop Up Display for Road Show or ExhibitionNextNext post:Why order your teardrop banners, Feather flags or print your fabric and flags from us ?